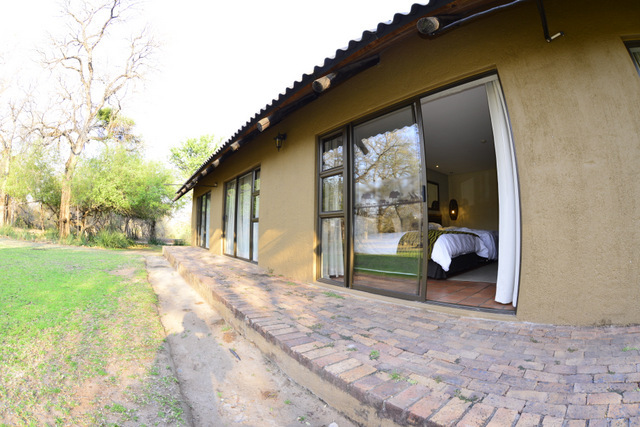 This Hotel is perfectly located on its private reserve which is just 100 meters from Paul Kruger gate on the banks of the Sabie River, with a lovely view looking into the Kruger National Park. 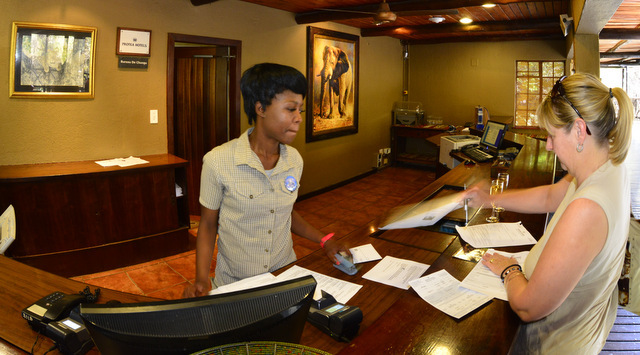 The hotel has the feel of a hotel but the look and warmth of a safari lodge! 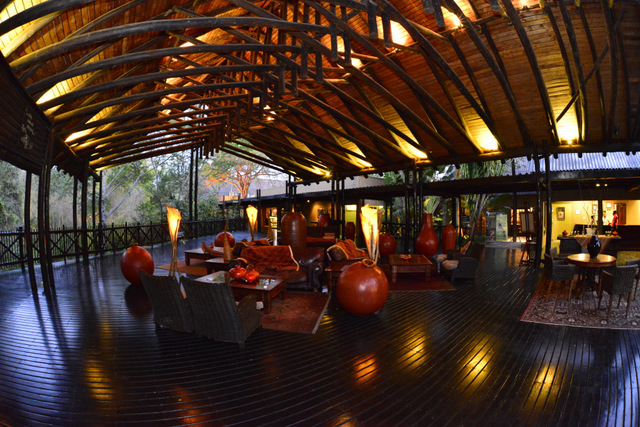 We arrived with the beating of the drums and a nice cold welcome drink then it was check in time. As we arrived we were very impressed with the layout of the hotel and the feel of it. 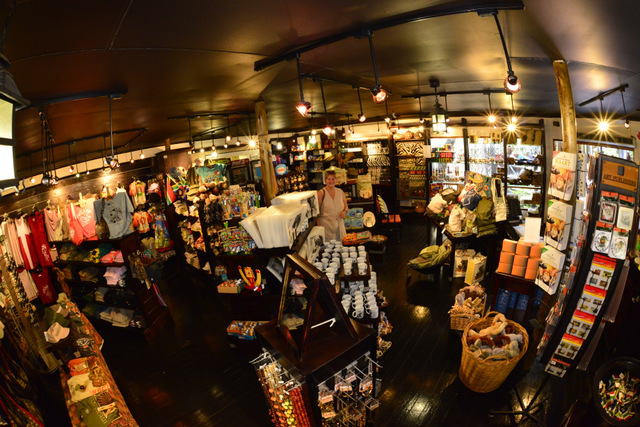 The main area has a large entrance leading down to the reception area with a well-stocked curio shop on the left and a large seating area in the middle of reception. 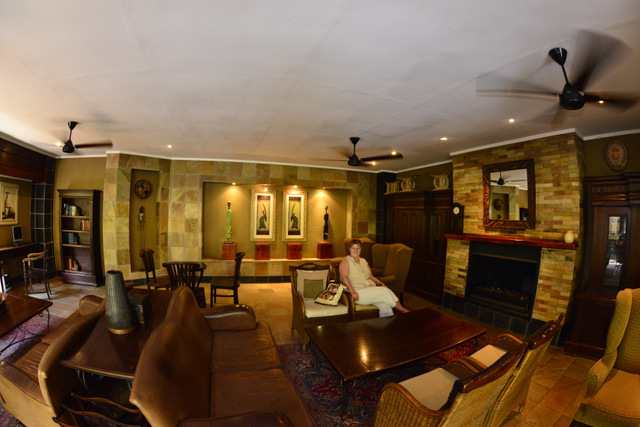 A stunning bar with great leopard pics lies next to a cosy lounge which has a large fireplace for those cold nights. 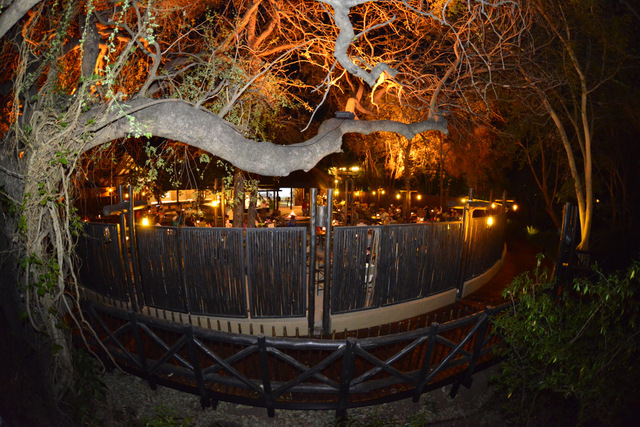 Toilets lie between the bar and the Kudyela restaurant, where guests can enjoy a buffet style breakfast or a’ la carte lunch on the wooden deck. 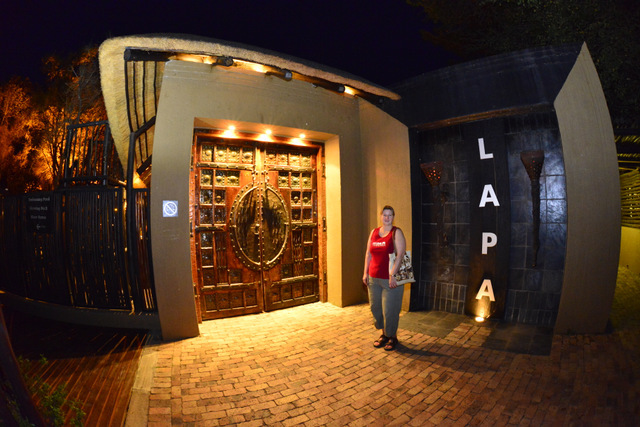 A wooden walkway leads down to the hug Lapa where sumptuous buffet dinners are served and I can tell you these are like no other dinners we have ever had, it has restored our faith in Buffets. From the roasts - lamb, beef, & pork - to the curries, salads, pastas, stir-fries, potjies to the wonderful selection of sweets, we could not fault anything. 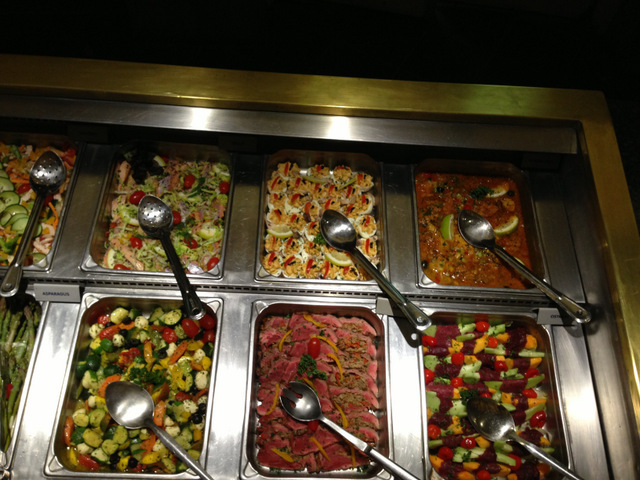 The food is just fantastic and well worth every mouthful. 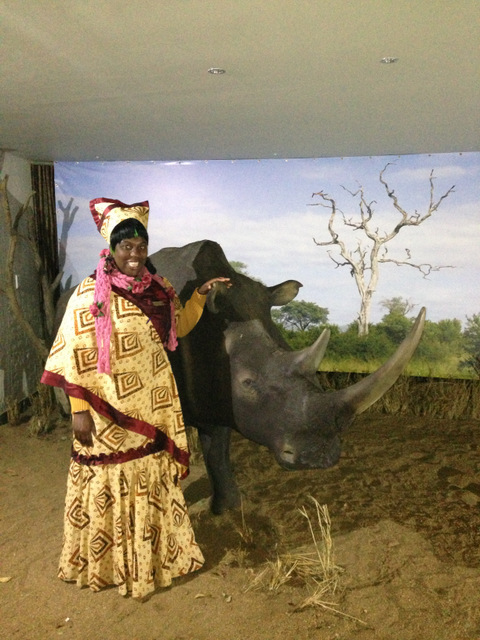 Our hostess posed for a photograph next to the rhino they have near the dessert table. She was dressed in her traditional Shangaan outfit. People stop to have their photographs taken next to the rhino - then it is emailed to you. This is a lovely touch for both local and overseas visitors who will have this as a memento. 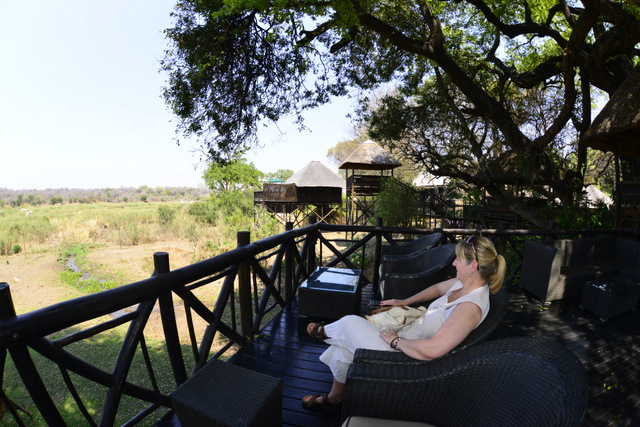 A shaded wooden walkway leads to unique seated viewing decks, with views over the Sabie River. On the far right of the walkway is the Spa and on the left is the sundowner bar, which then leads down to the swimming pool area – they have a kiddies playground, tennis court, volleyball and putt-putt. 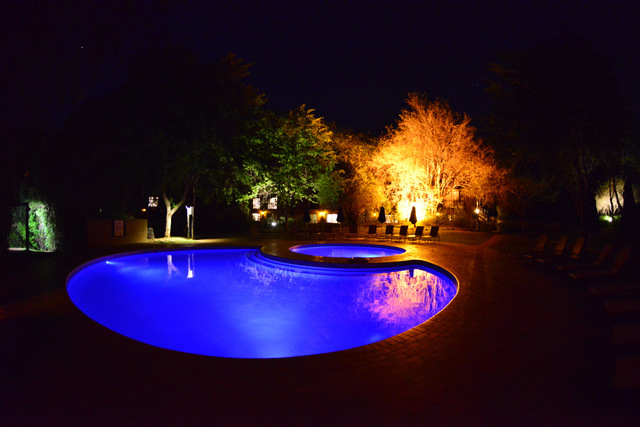 So there is something for everyone at the Protea Hotel Kruger Gate. 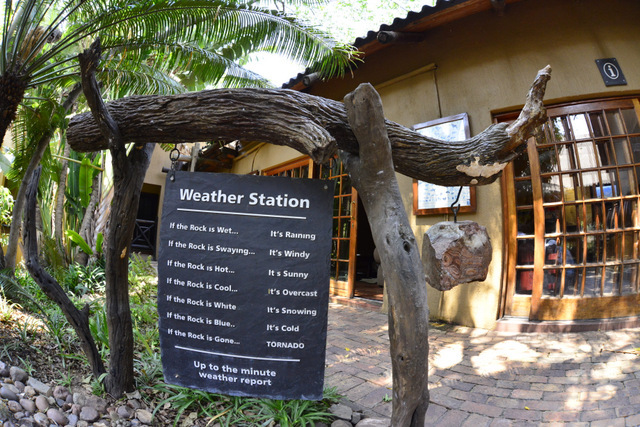 Look out for the weather station that gives you an up to date weather forecast every day (it's a hanging rock!). 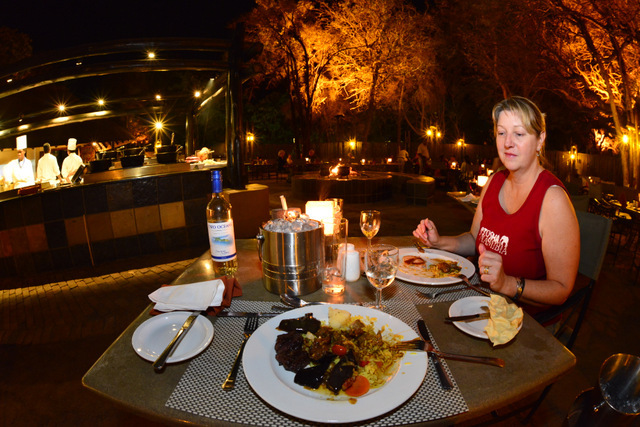 The hotel has 96 en-suite rooms and 7 six-sleeper self-catering chalets. 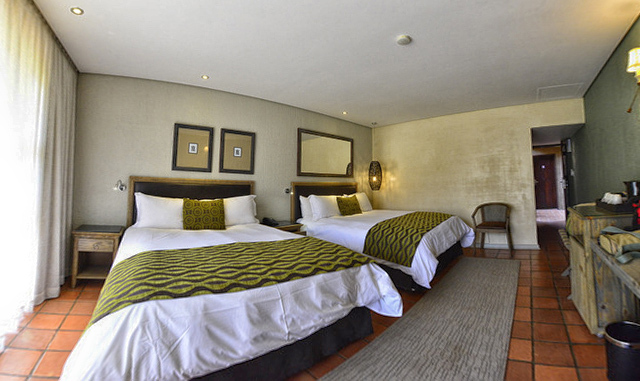 Each hotel room has a satellite TV, tea-coffee making facilities, mini bar fridge and one or two queen size beds. Large sliding doors lead onto the gardens of overlook the swimming pool area. 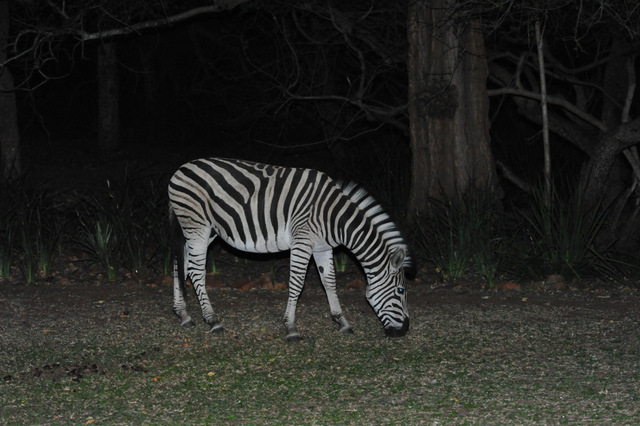 Bushbuck, Zebra and Blue wildebeest can be seen grazing on the lawns. At reception there is a picture of a leopard, when I asked where the picture was taken the guys said outside one of the rooms……so here the wildlife comes to you! 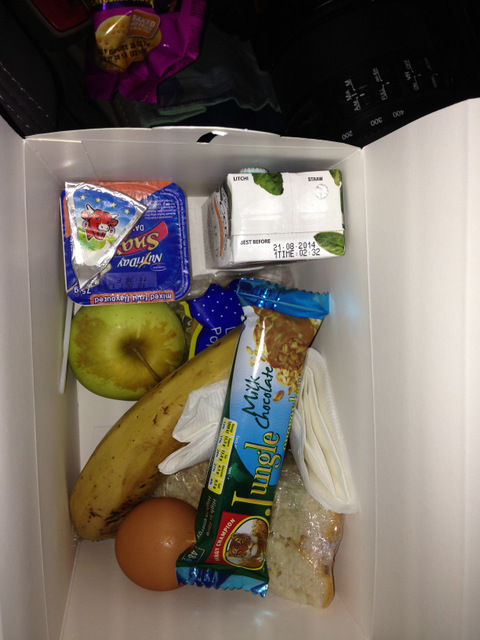 Every morning when we left to go for our self-drive safari we got our breakfast box which was great and kept us going till dinner time. 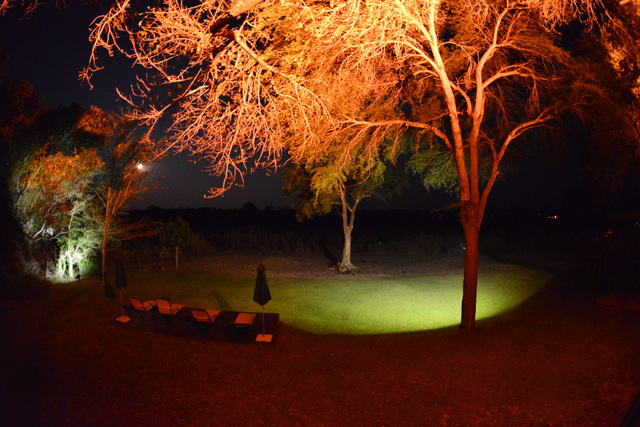 We stayed at the Protea Hotel Kruger Gate for just three nights but saw six of the super-seven animals! 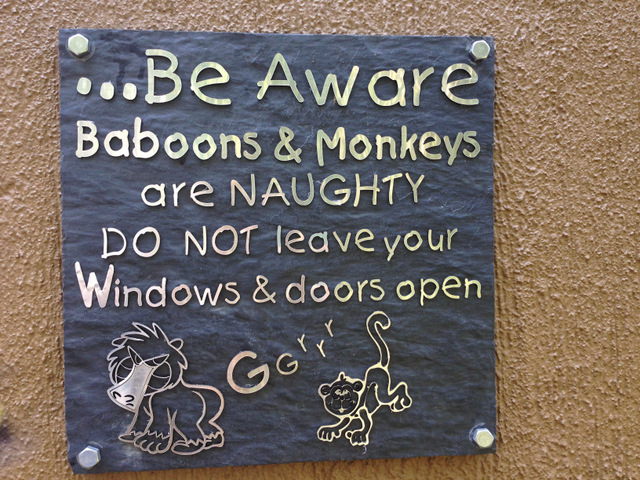 We saw the Big-five plus wild dogs - the only animal we missed was the cheetah. 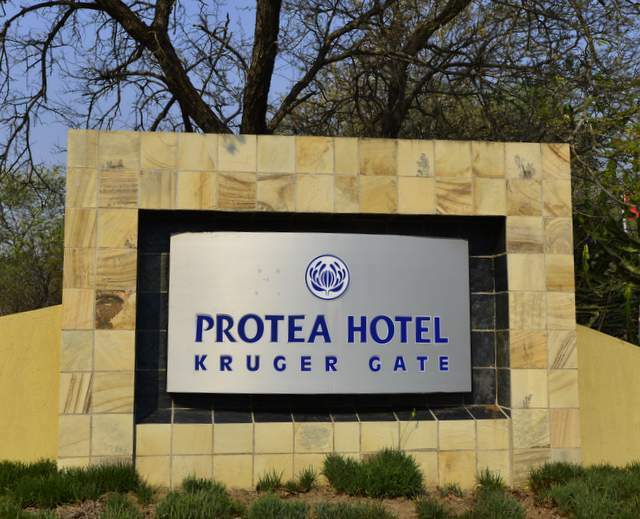 We really had a great time and a big thank you to all the Protea Hotel staff members who made our stay a memorable one! 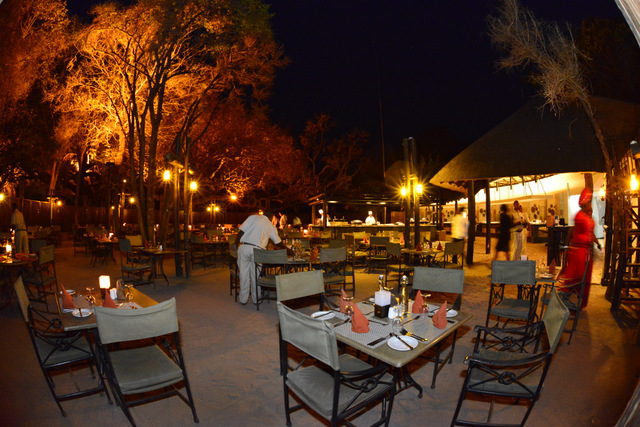 For more information or to make your booking please click here.